After a couple of years of paying $0.90 per share, will Intel finally raise its dividend in light of recent good news? While capital gains are an important part of total returns, dividends are also an integral -- if less exciting -- part of the long-term investment equation. A high-growth stock still in the early innings of a multi-year growth path isn't going to worry so much about returning cash to shareholders, but a larger blue-chip name like Intel (NASDAQ:INTC) that generates more cash than it knows what to do with will return part of it to shareholders via dividends and buybacks. That said, after a couple of years of no dividend increases, Intel stockholders are wondering if it's now time -- particularly after the most recent guidance raise -- for a dividend increase. At the company's 2013 Investor Meeting, it was made quite clear that Intel's capital return policy calls for a dividend of approximately 40% of free cash flow. At today's $0.90/share, Intel is returning about $4.5 billion/year in the form of dividends alone, or approximately 51.3% of trailing-12-month free cash flow. 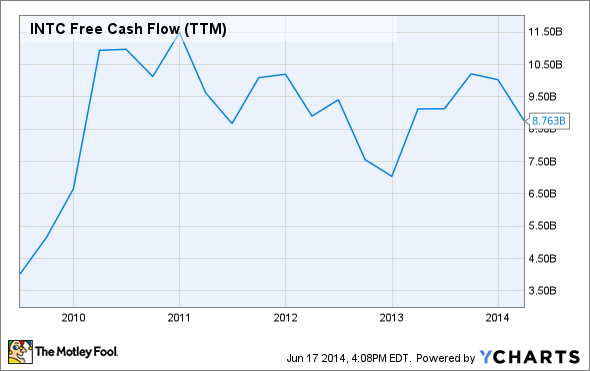 INTC Free Cash Flow (TTM) data by YCharts. Now, for a capital-intensive company like Intel, the free cash flow picture can often be a bit lumpy depending on the timing of capital expenditures (this is in stark contrast to competitor Qualcomm (NASDAQ:QCOM), which spends little on capex and sees the majority of its cash flow in the form of royalties). As far as the dividend goes, we can probably use GAAP earnings per share to get a sense of where the dividend is headed in the long run. After Intel's revised guidance for the quarter, current sell-side consensus sits at $2.02/share on revenues of $54.54 billion. A 40% payout ratio based on that number works out to roughly $0.81/share. The dividend currently sits at $0.90/share, so Intel is still running a bit hot relative to its stated dividend payout target. Something investors also need to be aware of is that capital returns need to be done with U.S.-based cash. The costs to bring cash generated overseas (for tax purposes) can often be substantial, which is why this is not a particularly attractive option for many companies. Note that according to Intel's most recent form 10-K , only 17% of its revenues are generated domestically, with the rest generated overseas. This suggests Intel is paying out all of the profits it generates domestically -- and then some! While investors would certainly love to see more of their money returned to them in the form of dividends, Intel's dividend program is already quite generous -- it's still yielding far more than nearest competitors Qualcomm, at 2.12%, and Taiwan Semiconductor, at 2.36%. Over the long run (think two to three years), Intel may be able to dramatically up its dividend as earnings grow, but in the near term, the dividend still looks pretty healthy and quite generous even without a raise.